Despite the rather interesting name, Santa Claus melon has no relation to Christmas at all - in fact their summer seasonality, super sweet taste and juicy fruit conjure up images as far from Christmas as we can possibly get - more tropical beaches and salty hair than woolly jumpers and log fires. 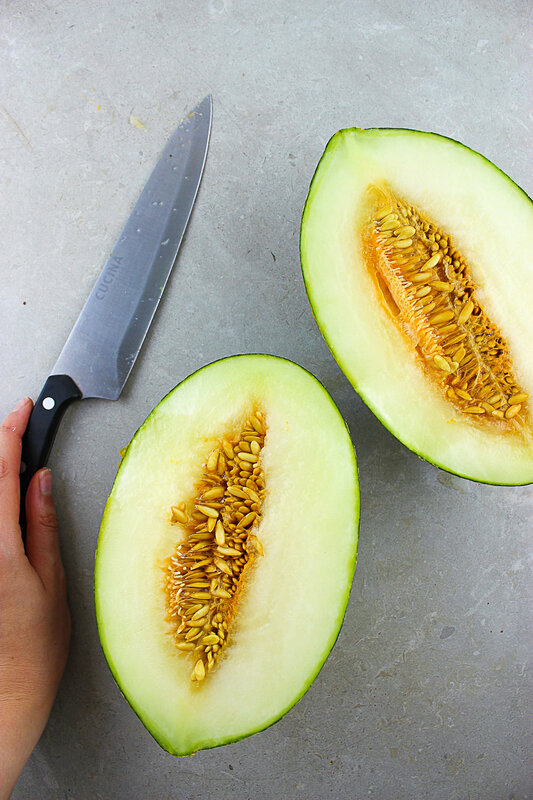 And whilst we may not have many tropical beaches in the UK, we do have santa claus melon on our shelves, which is reason enough to pick one up for a sweet slice of summer. With an intense sweetness similar in flavour to honeydew melon (think honeydew on steroids and you’ve got santa claus), and a juicy inner fruit, they’re bigger in size than your galia’s and canteloupe’s yet not quite in line with watermelon, and can be recognised by their green and yellow streaky skin. The main variety available in the UK is the Spanish grown ‘Piel del Sappo’, which translates into the skin of the frog. It’s best enjoyed fresh, or take advantage of firm flesh by grilling it for the perfect post BBQ dessert. - Salsa: The sweet taste works great in a salsa - slice into tiny chunks then mix with cucumber, raw red onion, olive oil, salt and lemon juice for a summer-y salsa. - Homemade ice lollies: ice lollies were a stable in childhood summers, but the amount of refined sugar has steered us clear for yours. Take advantage of the sweet flavour of the melon by blending it with a little lime and freezing them to make grown up ice lollies (bonus: add a little white wine to the mix to make them even more grown up). - Similar to watermelon slush, freeze slices of Santa Claus melon then blend with lime for a summer slushie.